WrestleCrap Radio - Episode 258 with Bill Apter! - WrestleCrap - The Very Worst of Pro Wrestling! WrestleCrap Radio – Episode 258 with Bill Apter! It’s the first WrestleCrap Radio of 2016, and the boys are joined by the legendary Bill Apter! 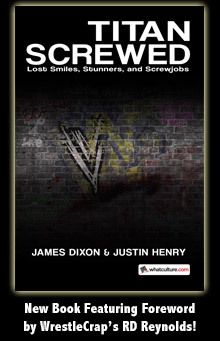 Pro Wrestling Magazine talk aplenty plus the inside scoop on Bill’s new book, Is Wrestling Fixed? I Didn’t Know It Was Broken! Listen to the show below, by subscribing on Stitcher or iTunes, or by clicking here! WrestleCrap Radio - Episode 257! 6 Responses to "WrestleCrap Radio – Episode 258 with Bill Apter!" My favorite Harry character was Lee Marshall. He really nailed the whole WEASEL joke thing. My Aptermag story is when Shane Douglas threw down the NWA title and declared himself ECW World Champion I wrote to PWI complaining that they wouldn’t recognize the title as a world title and it got printed. Would the Bill Apter action figure come with crown as illustrated? This was a great interview! I hope you have Bill back on the show sometime down the line. I can never make out the audio… can a Crapper tell me… What is Bill saying in the laughing woman’s voice when he’s talking about the Invisible Man? The thing he has to say anytime he speaks to Jerry Lawler. RD, do you have a better idea? ?